"Books gave Matilda a hopeful and comforting message: you are not alone." The phrase "labor of love" comes up over and over in conversations with those involved in the '90s kid classic, Matilda. Director-star Danny DeVito, writer Robin Swicord, lead actor Mara Wilson's mother, and cinematographer Stefan Czapsky had read the book to their children, and gave everything to adapting Roald Dahl's book. The result is a kids classic, which hit theaters 20 years ago today. I do remember feeling a little scared when I read the script. A little scared. Swicord: He cared enormously. His kids loved the book. That whole thing that had happened in our family was also happening in his [...] He wanted his wife [Rhea Perlman] in the film. He wanted to narrate it, which I felt was kind of confusing at the creative level in terms of, "Why is it the father's voice? Why is Matilda's father telling her story?" It felt like it should be more like the voice of God. It should be Roald Dahl's voice? But, you know, it was personal for him. I really appreciated that. Swicord: That's a line that I wrote. That's not a Dahl line…The library was my solace. It was the thing that connected me to the larger world. I knew that I was a writer very young, as soon as I learned to read I knew that I was a writer. I felt that the books that I was reading were literally the voices of authors who were calling me forward out of the world that I was in. Swicord: We had a thing in our contract, which was to protect Roald Dahl and Liccy [Dahl, his widow], which was that we would not be rewritten […] We learned that [DeVito] had written his own adaptation, borrowing heavily from ours, but changing a great deal. Liccy was unhappy about that [...] The only real way to resolve it was to either pull it back from the company, which Liccy was not inclined to do. She wanted to protect her relationship with them. Or for us to come forward and essentially bring in a litigator and say, "You cannot rewrite us." We were the ones that had to do that, not Liccy. And so we did. And it was very unpleasant… That bastardized screenplay was set aside, and we just proceeded as if that incident had never happened. Swicord: [In our script], we had leaned a little more on tension and suspense and anxiety, and a little less on terrifying, ogre-like stuff [...] There was going to be no budging him off certain things. In the first screening we saw some mothers taking small children out, and we were very depressed. Stefan Czapsky (director of photography): Danny did a very sort of toned-down version of the book. It could have been much more extreme. 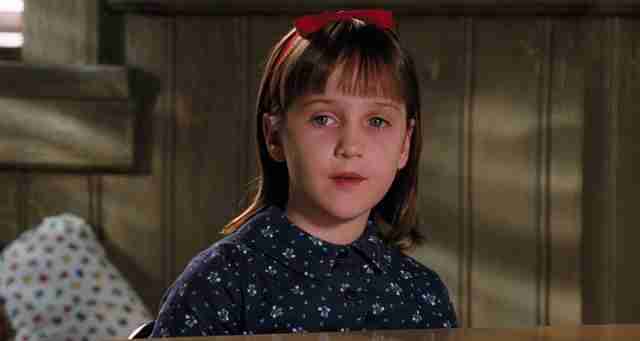 Mara Wilson (Matilda): I do remember feeling a little scared when I read the script. A little scared. Danny DeVito, to Chicago Tribune, 1996: "It's out there, isn't it? [...] Kids love it. I've shown the movie in about six stages to big groups of kids, and the response was so positive that this dark pill got easier for the studio to swallow." Wilson: People don't believe me, but Pam Ferris is the kindest, gentlest human being you will ever meet. She's so good at it. She just disappears into that part. DeVito, to Chicago Tribune, 1996: "I mean, I was looking at opera singers. I was looking at female wrestlers. Finally, I got a tape in the mail from an English actress… This tape was like, wow, Robert Morley on a really bad day. She was just standing there, talking to these imaginary children like they were little carbuncles. She was bliss." Czapsky: In terms of precision -- of combining the placement and movement of the camera, and her being able to precisely land in that spot exactly -- you know you're working with a trained actress. An actress who encouraged the part to be scary. That probably was the most fun, just shooting Trunchbull. Swicord: That is a line that I put into it, and it goes back to a job that I had in my mid-20s. I had just come to New York and the day job that I could get was working at an ad agency, and I was writing copy. They got the Peak Frame -- which is a British cookie -- Peak Frame Cookies account. My boss wrote the line: "much too good for children." So I just lifted that. 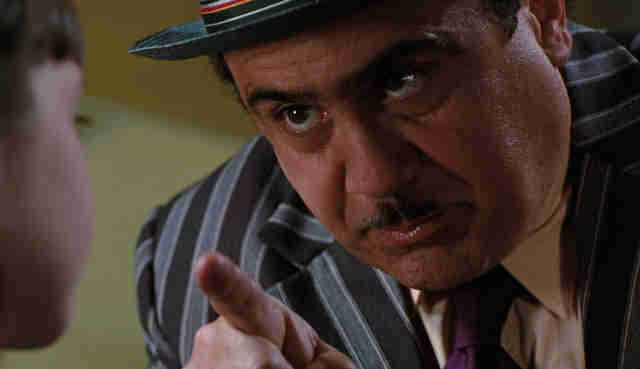 Czapsky: I had photographed Danny as the Penguin in Batman Returns… He could have hired anybody who wanted to. He liked the wide-angle photography that was there, [like] Edwards Scissorhands [...] He purposefully created sets in which you could see the ceiling and the background. [Danny] loved being photographed by the [wide-angle] lens. He had a face that actually could take the 10 millimeter. We used it both for Mr. Wormwood and the Trunchbull. Wilson: On Mrs. Doubtfire I was actually learning how everything worked for the first time. On Miracle [on 34th Street] I was the one kid, so everything needed to be taken so seriously. On Matilda though, I felt creatively involved. I designed the dolls that Matilda has in the movie. That was Danny's idea. I think I shot 144 angles of him eating cake. Swicord: There were times when, in the budgeting process particularly, [producers] were going, "Do we really need the Bruce Bogtrotter scene with the chocolate cake?" Because it doesn't move the story forward. But I really loved that scene because his superpower was that he could eat a lot of chocolate cake. Czapsky: The chubby kid... is it OK to call him chubby? [Ed. Note: That guy's ripped these days, by the way.] Anyway, he hated chocolate cake. You say: how can you hate chocolate cake? But he hated it! DeVito, on the 2005 Matilda DVD documentary: "This is really gross, [but] I'm going to tell you anyway [...] We made him stuff his face, but then I would cut the camera [and] he would spit it out!" Czapsky: I think I shot 144 angles of him eating cake. Wilson: The scene where we storm the Trunchbull out of Crunchem Hall -- that was a lot of fun. It looks like anarchy, and it kind of was. It was all of us just throwing stuff at Pam. And filming the montage at the end with Embeth [Davidtz]. We actually did get to have a picnic, and we actually did get to roller-blade in the living room, and we actually did get to eat chocolate. And that was really fun. Wilson: I didn't know [at the time]. She was so resilient and so strong, and that was what she prided herself on, and there was a lot of help from the people there. The DeVitos were definitely very helpful, everyone there, our studio teacher Richard [Wicklund]. Everyone on set gathered around me and took care of me [...] After she went to the hospital [during the shoot], she actually wrote up a letter thanking everybody for all their support and gave it and sent it to Danny. They passed it to the call sheet the next day just so everybody would know. Matilda is really what got me through that, I think. There is no question that I would have gotten through that year and the next year of publicity and everything without Matilda. Wilson: I get very critical of myself. 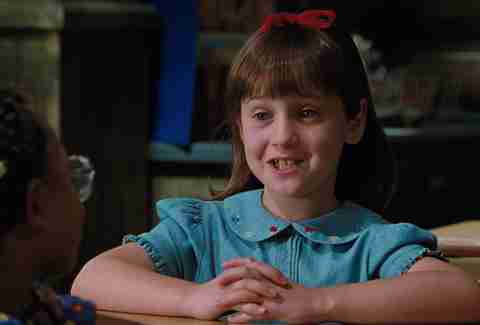 In fact, Matilda is kind of an oddity because I do like watching it. Or I like watching it more than some of the others, because I feel proud of how I did in it. Eric Vilas-Boas is a writer who hopes to express his love for Matilda to Danny DeVito one day. Hopefully DeVito will follow him on Twitter.